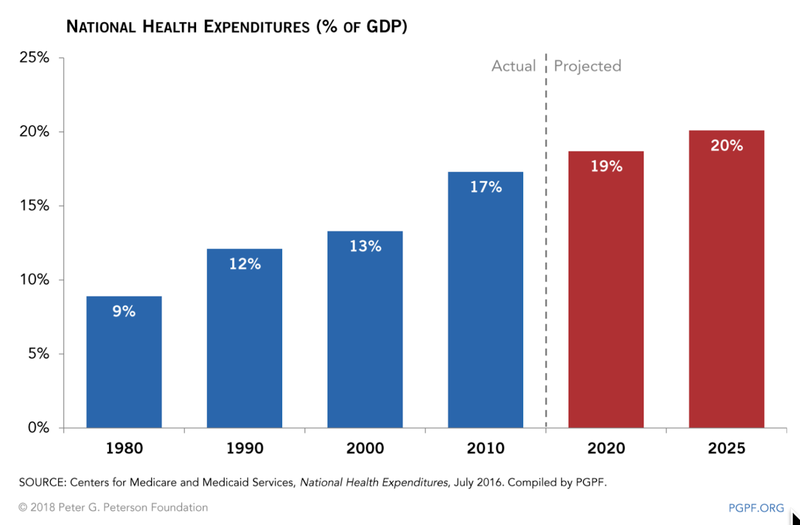 The support of health care has become the most significant item in the Federal budget as well as in retirement planning. This blog will concentrate on the issues that concern the adequacy and effectiveness of US health care. 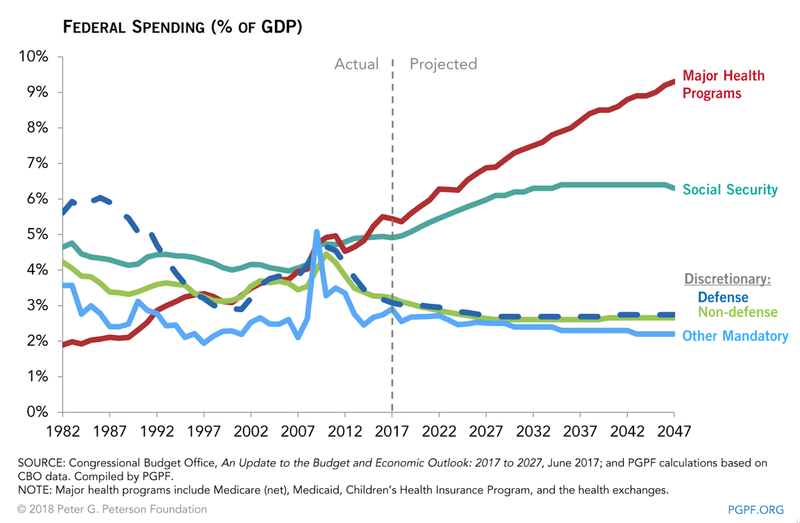 The US excess spending is best illustrated by showing the allocation of health care spending in the current Federal federal budget. Health care exceeds all other items in the budget, including expenditures for Defense as well as for all other expenses to keep up government in operations. High levels of expenses in the Federal budget can be also compared with per capita expenditures in other countries. The US $9,024 per capita spending represents 30% of the 2015 median income per capita of $30,240/year. That represents 15% of total income per year spent on food. With allowances for taxes the cost of health care plus the cost of food will take half of a person's average income. If consideration is given to a large part of the population that earns less than average income, the allocation of money to essential subsistence leaves little for clothing, education or housing. International comparisons on a per capita health spending show a very large disparity. 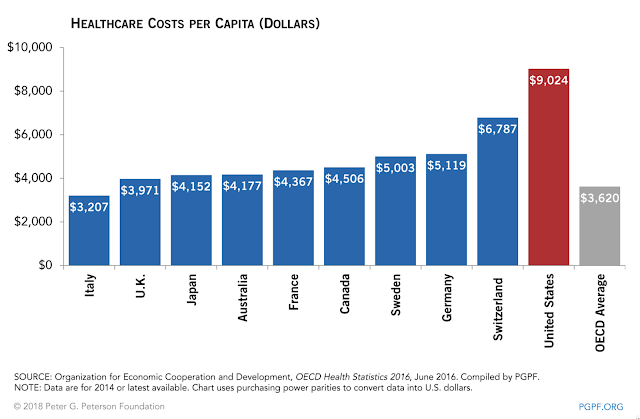 In comparable countries such as Canada and Australia, the US average health spending would not be tolerated. The disparity between spending and effectiveness of health maintenance is best illustrated by plotting the average life expectancy of the population as compared with their spending for health care. 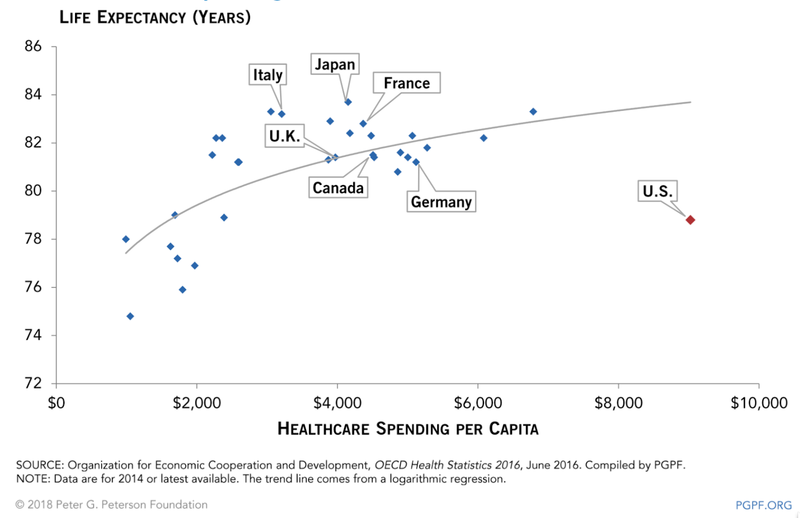 US, with average life expectance of less than five years as compared with Canada, the costs of health care spending in 2018 were more than 100% greater. 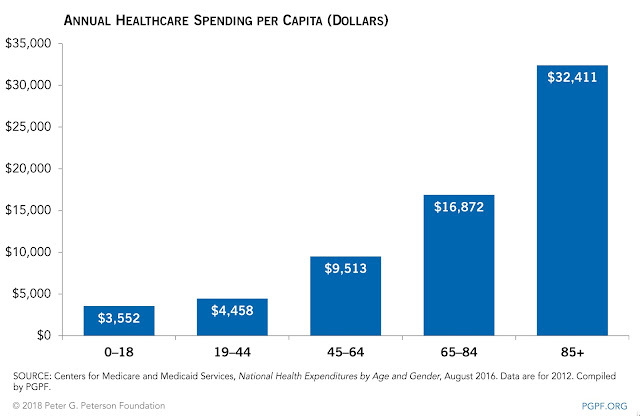 The primary cause for the rising healthcare costs is the increasing age of the population. End-of life medical costs escalate rapidly. 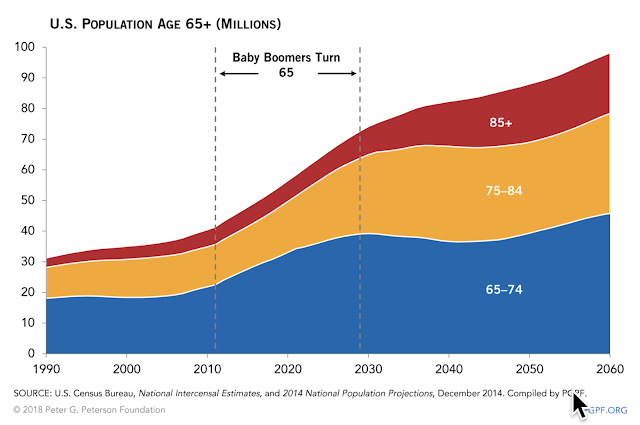 The immediate prospects for the US is for over 19% of its population to be over 65 years. Such shift not only increases healthcare costs but also reduced the number of the remaining population that is taxed for support of their elders. There will be 38% less workers supporting the aged in 2030 than was the case in 1970. The underfunding of Social Security and Medicare support will continue to deteriorate. 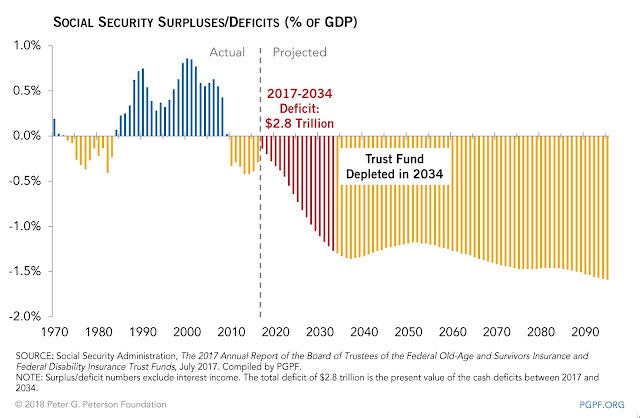 The current projections show an actuarial bankruptcy of the Social Security trust funds that is not getting paid from an accumulation of funds but directly from the US treasury that had used the collected Social Security funds to pay for current operating expenditures of the Federal government. 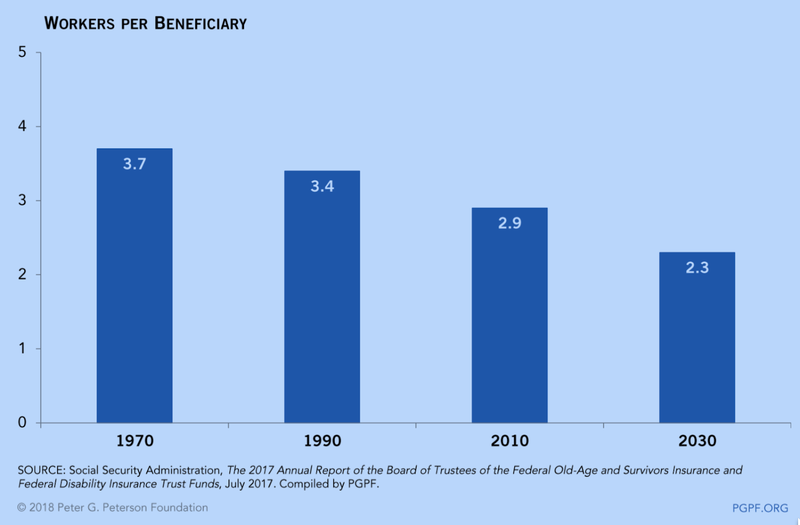 A very large share of the US population now depends on social security as a principal means for supplementing their income. 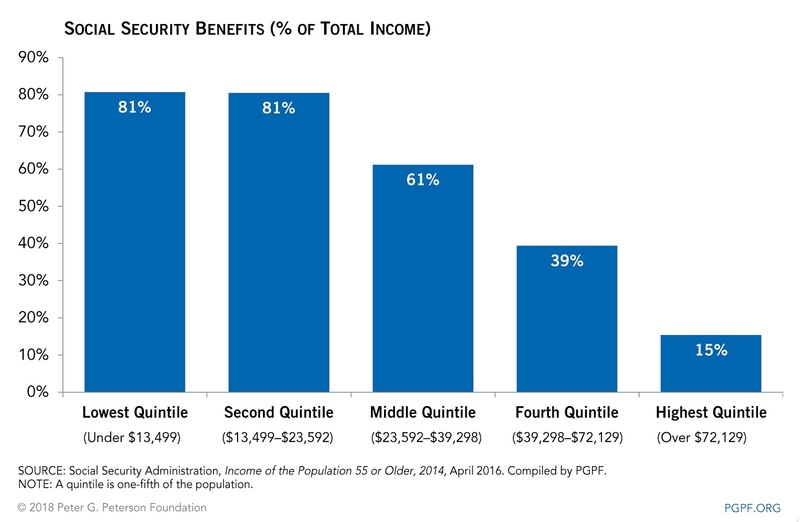 Only the top 40% of the retirees have a sufficient income not to rely on social security as their principal means. Our analysis shows that a large share of the US population will not have adequately funded retirement years in years to come. As the economic conditions deteriorate, the prospects of well funded retirement years are vanishing. Only a reversal in the current national economic prospects can reverse that. Unfortunately, thee conditions that prevailed for the last few generations (1950 to 2007) are now rapidly vanishing and are unlikely to be reversed. The only solution for the coming new generation of your is to concentrate on choosing an occupation that will support them during the coming era of technological obsolescence and social instability. The accumulation of savings for retirement from personal savings rather than from public assistance should be now seen as the answer to the deterioration of social services. As the immediate priority the maintenance of excellent health becomes the single most controllable act that becomes absolutely necessary for every person. Superior health and a superior physical condition becomes the prerequisite for avoiding expensive health care.